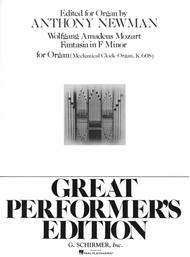 Fantasia in F Minor, K.608 (Great Performer's Edition) (Organ Solo). Composed by Wolfgang Amadeus Mozart (1756-1791). Edited by Anthony Newman. For Organ (Organ). Organ Large Works. 16 pages. G. Schirmer #ED48002. Published by G. Schirmer (HL.50292260).